Saying that it is “consistent with its long-standing commitment to transparency,” the Bermuda Tourism Authority has released new financial data on its corporate website and to the media this week. And previously released staff compensation information from 2014 that has been refined at the request of the Information Commissioner. The BTA added, “Earlier this month the Bermuda Tourism Authority acknowledged the Information Commissioner’s ruling that the original 2015 PATI Request would have resulted in an “unjustified intrusion into the personal information of employees at the BTA”. “Further, the Bermuda Tourism Authority agreed to present the previously released data in a different way. This week that refined 2014 compensation information was released online [PDF] together with the information for 2015 and 2016. “Since its inception the Bermuda Tourism Authority has provided more information to the public than is legislatively required and again this week has proven itself a leader in transparency by sharing more financial data than the Information Commissioner requested in her recent ruling,” said Kevin Dallas, Bermuda Tourism Authority CEO. In delivering today’s Budget, Premier and Minister of Finance David Burt said, “The Bermuda Tourism Authority will receive an increase in funding of $1 million. The PLP has always held that we must increase the investment in our tourism marketing, and this Government will hold true to that promise. The audited financial statements do not include a separate line item showing the staff travel expenses, including this dollar amount be included to provide the total staff cost. So much for Civil Servants being top heavy. Did Burch fire the ones who screwed up…? Honestly the money that the individuals are making at the top is beyond ridicules. Yeah. Screw them. All they’ve done is work their A$$ off for thirty five years. They should be happy to let some lazy a&$ civil servant get paid the same. You’re wrong. People in those higher positions work extremely hard in both academics and in their career. Those positions require upwards of 10 years experience and also require a high degree of knowledge. Those people deserve to be paid that amount and at the end of the day these wages are no different than any other Destination Marketing Organization. Please get with reality. And de guys that pick up ya trash deserve de pay they get too. I find it unfortunate that the Commissioner has forced disclosure of people’s salaries and names. Top executives, sure, name them. But was it necessary to actually NAME the receptionist next to his/her salary? Jeez. I think the Commissioner is taking this to an extreme. Is de Union a public funded entity? Are union members members of the public? Are RBYC members members of the public? THE FIRST 10 starting from TOP are smiling and laughing straight to de BANK OMG!!!!!!!!!!!!!!!!!!!!!!!!!!!!!!!!!!!!!!!!!!!!! These people are making more money than the Permanent Secretaries of Gov! So wait let me get this straight. The BTA is the only government funded sector that is currently growing the economy and you’re complaining about their wages? These people work extremely hard to move this country forward. Why don’t you complain about the wages of the civil service? They are being paid far too much! Take these salaries and use it to offer free flights for 5+ night stays in Bermuda! That’s how to get the money coming in! Are you one of the top 10? Or are you related to someone in the top 10? I find it hard to believe that you are ok with these exorbitant wages when the highest paid person has just over 3 times the amount of the average civil servant’s salary. The way you expressed yourself hmmmmm it’s safe to say 1 of the top 10 is you. If your income was around $115k my guess is that you would die off that low salary.Lets be real as real can be……$120 ok that’s fine but $230 k and up. We tax payers are paying for this. You are making more than the President of the United States. I’m not one of the top 10. I wish. Unfortunately I am just like everyone else but I realize how much people like this make. 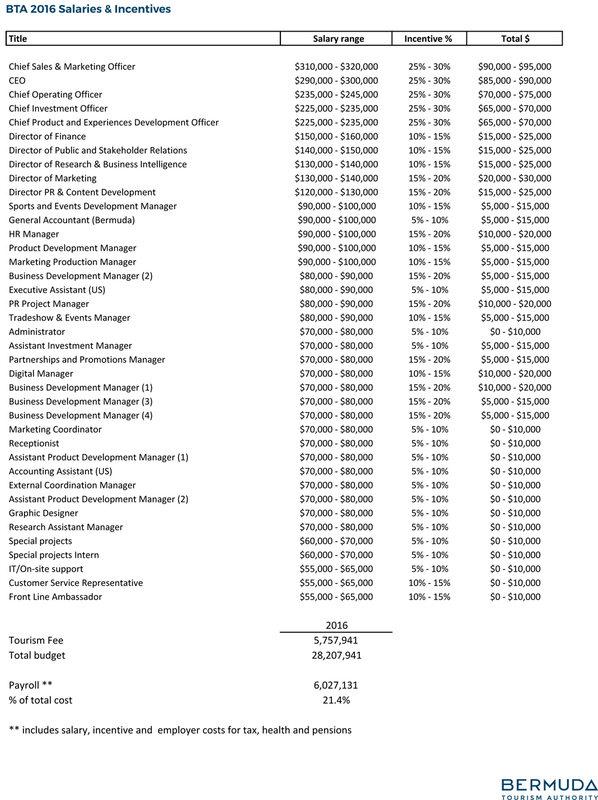 Look at how much people make in the IB sector. Just because you work for government doesn’t mean you should make less. A Chief Sales and Marketing officer is still a Chief Sales and Marketing officer regardless of whether or not they work in the public or private sector. They do the same job so they should get the same pay. The BTA chiefs are making waaaay too much money. They produced the worst tourism numbers back in 2015/2016 and yet they were given a major pay increase!! They are making more than the premier of the country. The BTA chiefs and its CEO need to go. This is not a private company…..Remember that! Maybe some of their salaries can go towards purchasing much needed trash trucks or even better maybe their salaries can go in the trash with them.